1917 Charlie Chaplin became the first actor with a million-dollar deal, signed with First National, a nine-film deal. 1917 The first African-American owned studio, the pioneering The Lincoln Motion Picture Company, was founded. 1917 Max Fleischer invented the rotoscope to streamline the frame-by-frame copying process. It was a device used to overlay drawings on live-action film. 1917 Italian-Argentinian writer/director Quirino Cristiani's El Apóstol (1917, Argentina) 70-minute long film (a lost film in a fire) was the world's first animated, stop-motion feature film (using a process of cut-outs). The only surviving elements of the silent, black and white political satire (of then President Hipolito Yrigoyen) were a few character sketches or designs. 1917 Producer Hal Roach's sport comedy short Over the Fence (1917), directed by silent film comedian-star Harold Lloyd himself, marked the first time that Lloyd wore his trademark circular, horn-rimmed eyeglasses and a boater hat. He had grown tired of his "Lonesome Luke" character in numerous one-reeler comedies and decided to test out a new persona - the "glasses" character. 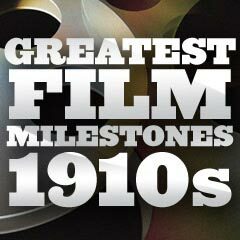 It was the first of Lloyd's four directed (credited) films from 1917-1919. Lloyd would go on to star in many classic feature-length film comedies in the 1920s as the "glasses" guy, his signature character. 1917 The first feature-length motion picture produced in two-strip Technicolor in the US was The Gulf Between (1917). It was also the third feature-length color movie. It is considered a lost film, with only a few frames surviving. 1917 Famed westerns director John Ford made his first films, ten of them, in the year 1917. His first film, the two or three-reel The Tornado (1917), is now considered a lost film. Ford's first feature-length film production was Straight Shooting (1917), also his earliest complete surviving film - a western with his popular collaborative actor Harry Carey, and Hoot Gibson.